A New Zealander by birth, Keith Park had an outstanding record during the First World War. He began his military career with the New Zealand Army and then transferring to the British Army as an artillery man, serving in Gallipoli and then on the Somme. After he was wounded, he transferred to the Royal Flying Corps, and was credited with shooting down some twenty enemy aircraft. Between the wars, Park was a Commanding Officer at Britain's peacetime fighter stations. Before 1940 he was appointed senior air staff officer to Sir Hugh (later Lord) Dowding. At the beginning of the war, when Fighter Command was divided into Groups, Dowding had no hesitation in placing Keith Park as the C-in-C of 11 Group, the most important Group in Fighter Command. This Group not only protected the southern coastline of Britain and South-East England from enemy attack, but was defending London which was a prime target for the Luftwaffe’s bombers. 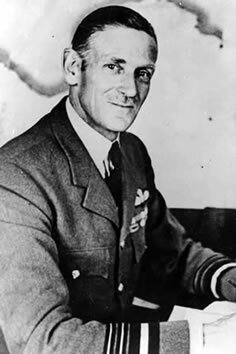 During the evacuation of troops from Dunkirk, Keith Park organised the air protection, shuttling his fighters back and forth across the English Channel and intercepting the Luftwaffe as best they could before the Luftwaffe could attack the tired and exhausted British troops on the beaches. Members of the British Expeditionary Force greatly criticised the Royal Air Force for not providing greater cover for them, blaming them for the number of casualties sustained on the beaches. It was not until the resounding success of the Battle of Britain that the RAF received the respect that they deserved and even then, many soldiers could still not forgive the RAF for what happened at Dunkirk. Park later stated that, under the circumstances he had done his best with what was made available to him. He had only a small number of aircraft to deploy on these missions, and what aircraft did take part could only spend limited time over the battle area due to shortage of fuel. He sympathised with those that had turned against him at the time, but the battle over Dunkirk made our pilots battle hardened for the forthcoming Battle of Britain. If Hitler was to invade Britain, or force the British Government to the negotiating table, as a first step he had to gain control of the air. The Battle of Britain was the first major campaign to be fought entirely by air forces. The RAF had 531 serviceable fighters out of a total of 609, in reserve another 289. The Germans, in total, had 4,539 aircraft. 2,936 pilots (from at least 12 countries) took part – 544 of them would lose their lives in the Battle of Britain. It is said Dowding controlled the Battle of Britain from day to day, while Keith Park controlled it hour by hour. Park organised and managed his squadrons and men brilliantly, he was respected and admired by many, yet as with all commanders one has to be open for criticism. Most of this was due to the fact that he fought the battle in a defensive manner when it was thought that he should give greater consideration to taking the fight to the Germans in an offensive manner. Park's answer to that was that the role of the fighter aircraft was one of defence and should be used in attacking those that were attacking us. Park's leadership, and his men's bravery, denied the Luftwaffe air superiority. Hitler called off his planned invasion of Britain – “Operation Sealion”. After the war, when the Nazi’s most senior commander, Field Marshal von Runstedt, was asked which battle he regarded as most decisive, he replied: “The Battle of Britain”. In a similar political move that forced the retirement of Dowding from the RAF, Keith Park was relieved of his command of 11 Group soon after the Battle of Britain, taking up a position with a training squadron. He was then posted to Egypt in 1941, and after that Malta, in 1942. His role in this island's defence was also pivotal. Park's ingenuity, aggression and eagerness to help in these theatres of aerial operations did not pass unnoticed. Eisenhower (in Algiers) expressed himself 'most grateful for the splendid support afforded by air operators from Malta' and Montgomery praised Park and his men for their assistance to the Eight Army. After Malta, he was posted to South-East Asia in 1944-46. 21 October 1916 Park blown off his horse by a German shell. Wounded, he was evacuated to England and graded "unfit for active service"